Congratulations to Dr. Scott Chambers of Pacific Northwest National Laboratory in being named a Fellow in the American Association for the Advancement of Science. The AAAS is the world's largest general scientific society and publishes the journal Science. The association gives the honor of Fellow to members who have made particularly distinguished scientific contributions. Chambers’ research focuses on the growth and properties of crystalline oxide films. Oxides have wide-ranging properties, making them useful for electronic and magnetic technologies, as well as for catalysis. Chambers studies the fundamental relationships between composition and structure, and the resulting electronic, magnetic, and photochemical properties. Understanding these structure-function relationships enables new technological applications of these materials in solid-state electronics and energy conversion. In addition to his own research, Chambers assists users of the Department of Energy’s EMSL in designing experiments and growing oxide films for their own use. In July 2009, he was named a Wiley Research Fellow. As such, he will lead the design and construction of EMSL's third generation oxygen plasma assisted molecular beam epitaxy system. The system will enable the controlled growth of oxide films of increasing complexity. 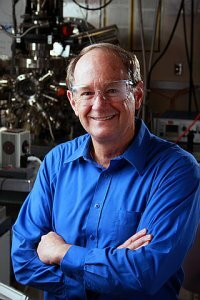 Chambers is a PNNL Fellow, an American Vacuum Society Fellow, and Affiliate Professor in the Departments of Chemistry, and Materials Science and Engineering at the University of Washington.